This award-winning luxury 16m x 4.2m pool by Portrait Pools features a custom manufactured Heatstar Phoenix climate control system with a special ‘quadruple’ stage air heating battery and up-rated air fan system. Heating a large body of water to a usually high temperature, and then dealing with the environment that it creates, makes a swimming pool one of the largest consumers of energy. However, in pursuit of the perfect energy efficient pool, there are ways of reducing energy consumption by using advancements in technology. Commercial pool operators and home pool owners could expect savings of 60% – 70% on overall costs, especially if they are using a good pool cover. 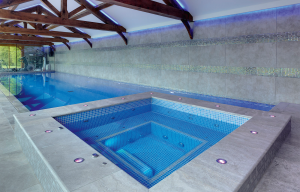 Says Certikin’s Graham Kneale: “Is there such a thing as a perfect energy efficient pool? No, each pool is individual and the energy requirements will differ for each situation.” But he adds: “Generally the most energy efficient thing to do is run with the lowest water temperature the customer is happy with, with the air temperature one degree C above this and humidity in the range 60-65%.” Highly-efficient building materials in the construction of the swimming pool and pool hall, such as good insulation to the hall structure, all assist in reducing the amount of heat loss. POOL COVER : A pool cover is essential. An insulated pool cover will reduce heat losses from a pool by 60% and is by far the most energy-efficient device anyone will fit to any pool. A manual cover and roller will typically pay for itself in less than a year. On the filtration side, using variable speed pumps and specialist filter media systems like the Dryden Aqua Daisy or Certikin’s OC-1 will make a dramatic impact on the energy costs. Payback periods of one to two years are easily achievable. Heat pumps have long taken the role of champions of energy efficiency for the water leisure market. The Inverter+ HP allows the heating capacity from 25% to 100% automatically according to pool demand, but most of the time, it only runs by middle and low speed for maximum efficiency. To read more on this story Subscribe Online today.